Generally, giving what you can to less fortunate folks is a good thing. However, on at least one airline, sharing what you've got with others can apparently get you kicked off your flight. That's at least what a first class passenger recently learned the hard way, when he got booted from a plane after trying to sneak free pre-departure drinks to his friends back in economy. The scene unfolded before takeoff on an American Airlines flight from Philadelphia to Atlanta over the weekend, as a guy with a first class ticket boarded with two friends who were seated in economy, according to fellow passenger Katie Genter, who recounted the whole ordeal for The Points Guy. 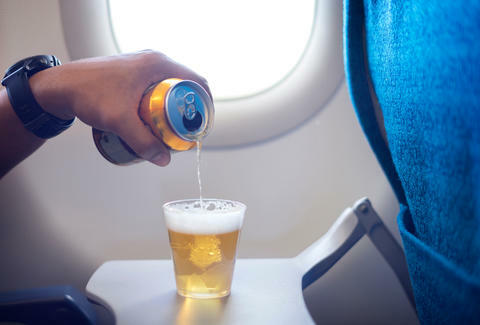 As the man with the premium ticket was settling into his seat, he downed a customary pre-departure drink and tried to order two more of them to bring to his pals in the economy section. The flight attendant refused his request, telling him he could only order one drink at a time, and that's when things got a little dicey. After being denied, the man lied and said the two subsequent drinks were for him and the woman next to him, and then attempted to smuggle them back to his buddies by claiming he had to use the bathroom. But the flight attendant wasn't having it, and told him he had to use the bathroom in first class. Steadfast in his determination to get his friends some gratis booze, the guy pressed on and appeared to text them to come up to the first class area pretending to go to the bathroom. That didn't fly with the flight attendant, either, who sent them to the economy bathroom in back. And he's out of here. Friends stayed. Door closed. At this point, the cabin crew clearly was not happy with the would-be free drink gifter, and a flight attendant had some words with him. An American representative also boarded the aircraft to speak with the man in the jetway, and ultimately, he came back to retrieve his carry-on and left. Genter says she overheard the flight attendant tell another passenger that the man would be rebooked on a later flight, but it seems he never was. "The customer caused a disruption during the boarding process," American Airlines told Travel + Leisure in a statement. "We did offer to rebook the customer on a later flight, but he declined and we provided a full refund." If anything, let this whole saga serve as a lesson that no matter how generous you're feeling, trying to pull a fast one on some eagle-eyed flight attendants won't get you very far. In fact, it might literally keep you from going anywhere.